Postcard High-Quality Printing and Mailing Services to suit your specific needs. Send your postcards using targeted postcard mailing. We make it easy by helping you find the right people and mailing your postcards for you! Pick a professional and modern business card design from our gallery. We print and address your postcards and mail them to your customers. 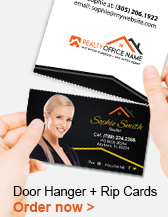 Realty Studio Design offers mailing services along with our Real Estate Postcard Design and Printing. Our services include: List importing from an Excel or Comma Delimited (.csv) file and includes CASS certification / NCOA / Presort. We will print address data on postcards and hand deliver to the U.S. Postal location nearest our facility for mailing. 4″ x 6″ postcards for 1st Class Presort Mail. 5″ x 7″ and 6″ x 9″ postcards for Presort Standard Mail. 5″ x 7″ and 6″ x 9″ postcards for 1st Class Presort Mail. Please note: All prices are based on a one time mailing and data processing service. Postage charges are estimates based on the list provided. – To accept address printing, Postcards will be printed with UV coating only on one side. – Mailing list format should be in Excel or Ascii Comma Delimited format (.csv). – Turnaround time for processing is 2-4 business days after printing is complete. – Post Office mailing time First Class 3-5 business days – Standard 10-15 business days. – Any changes to the specifications will require a revised quotation. – All services are final upon approval. – Our liability is limited to the amount of our invoice (excluding postage). – Actual postage figures will be determined after running your mailing list. – All prices are based on a one time mailing and data processing. NOTE: Since our permit number is indicated on the table above, we will not be able to send you the remaining pieces of your mailing order. For example, if you ordered 5000 postcards and there are only 4,500 valid contacts, the remaining 500 postcards will not be sent to you. Postcards are a highly effective and efficient way to reach people at Realty Studio Design you’ll get the highest quality postcard printing, and delivered to you on time. Our custom postcards are printed on the same heavy 16pt card stock as our business cards in full color, double or single sided, with your choice of gloss or matte finish. Easily create an effective Real Estate Direct Mail Marketing Campaigns using our Real Estate Direct Mail Templates, upload your list, and we’ll take care of the rest! In just a few days your custom message will be in your customers’ hands. And, postage is included! 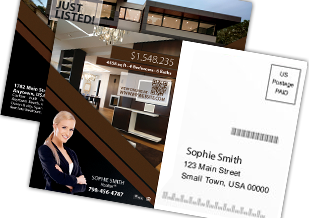 Real Estate Postcard Mailing Services, Real Estate Direct Mail Marketing, Real Estate Direct Mail Marketing Campaigns and Real Estate Direct Mail Templates. GET STARTED TODAY! Realty Studio Design has always provided fast, reliable, and enthusiastic service to our customers during the design process, print production and follow-on support. For more information about our Real Estate Products please Contact us online and we will be glad to help you.